Are you building an online business? Each week I plan on sharing the lessons that I’m learning so that you might learn right alongside me. I plan on sharing the good, the bad and the ugly. Hopefully the successes as well as the losses. I hope you will be my accountability partner and I can be yours. Cuz guess what? Building an Online Business Ain't Easy! Just ask Pat Flynn, Cliff Ravenscraft, Amy Porterfield, Jill Stanton, Leslie Samuel, John Lee Dumas, Chalene Johnson and Darren Rowse. Each week on the Building an Online Business Ain’t Easy Podcast, I share my journey with building an online business for local small business owners. These are struggles all business owners face and together we can realize we aren’t alone on this crazy journey. Are you building your dream business? So am I! Each week I plan on sharing the lessons that I’m learning so that you might learn right alongside me. I plan on sharing the good, the bad and the ugly. Hopefully the successes as well as the losses. Too often we feel alone on this journey, but you really aren't. There are others going through the same roadblocks, the same hurdles. Come hang out a few minutes a week with me. Cuz guess what? 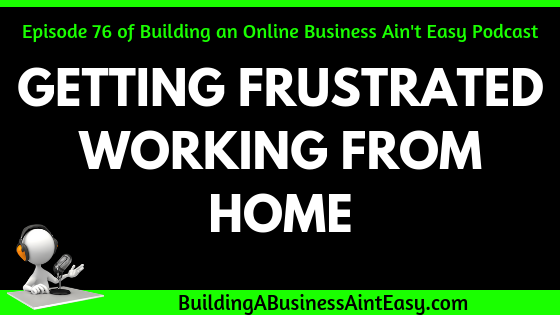 Building an Online Business Ain’t Easy!